I remember watching morning TV with a very sad relation of mine years ago. A group of school kids came on to sing a Christmas song, and he just couldn’t sit through it, he had to look away. “I can’t handle hearing kids sing like that”, he said. “It just makes me feel so sad. I don’t know why.” I didn’t know why either. It was the same confusion I used to feel when grownups would cry from happiness if they got given a nice gift, like an engraved locket or an ornate urn for the dead dog’s ashes. Happy tears were so far away from anything I could imagine that it made me feel uncomfortable when I saw it for real, it was too hard to get my head around - like trying to imagine a new colour. I just couldn’t sit through it, I had to look away. Walking down Uxbride Road today, I got why my temporary lodger couldn’t bare to watch the singing pupils on the TV screen. It was pouring down with rain and there were lines of kids walking at roughly a hundred miles an hour in puffer coats and woolly hats. I could tell from their unnaturally sensible shoes that underneath industrial jackets they were in their school uniforms, free from another day of forever sums and playground tribute acts. Rows of small gloved hands rushed past me to escape the rain, followed by clear-dome prams imprisoning at least a dozen babies and 4 teddy bears. Straight to jail for you Mr Snuggles, we’ve got homework to get back for. Seeing the school kids unleashed from school and out in a busy world of net-covered Christmas trees and shockingly light weight tinsel made me weirdly sad. They looked so free and everything around them was so big and shiny and promising so much. It’s the same thing that can make even me – an out and proud Christmas lover – feel down about the festive season. Realising I was in grave danger of morphing into the unhappy fella who sat on my sofa all those years ago, I made a run for a rest stop – naturally drawn, in my sudden mourning for the kid I used to be, by the icing drawn face of Scooby Doo. Scooby sat pride of place in the shop window of a Turkish bakery come custom cake shop, keeping an eye on the wedding cakes and candy glazed love hearts in case they took off their disguises. I spoke to the man in the shop immediately. “Did you make that cake?” I said with childlike excitement, pointing at Scooby. The noticeably long-lashed man behind the counter lit up at my enthusiasm, he began talking me through the cakes in a way that reminded me how people like to talk about their tattoos. Once he’d ran out of cakes in the shop, he went through his phone pictures. “This is Freddy Mercury wearing a crown”, “This lady has a ship in her hair because the couple who wanted it met on a cruise”, “I can’t tell you how I make them – I’d have to kill you!”, “we can make anything you want, anything”, “We’ve been making these cakes here for 9 years”, “Nobody does what we do.” It struck me that the real difference between cake art and tattoo art was that tattoos are there till the end where cakes are demolished in minutes. I couldn’t decide which was braver. Before I know it, I’m telling him about a friend whose birthday is coming up. “A male friend?” Yes – a male friend. “The body!” he exclaims. In my head, I’m imagining a life size cake to match my friend’s body. We are both super excited, like two kids in, er, a cake shop. He flips his phone out and shows me an iced torso he made just a few weeks ago. It’s not quite what I was hoping for, but hell I’m invested now. 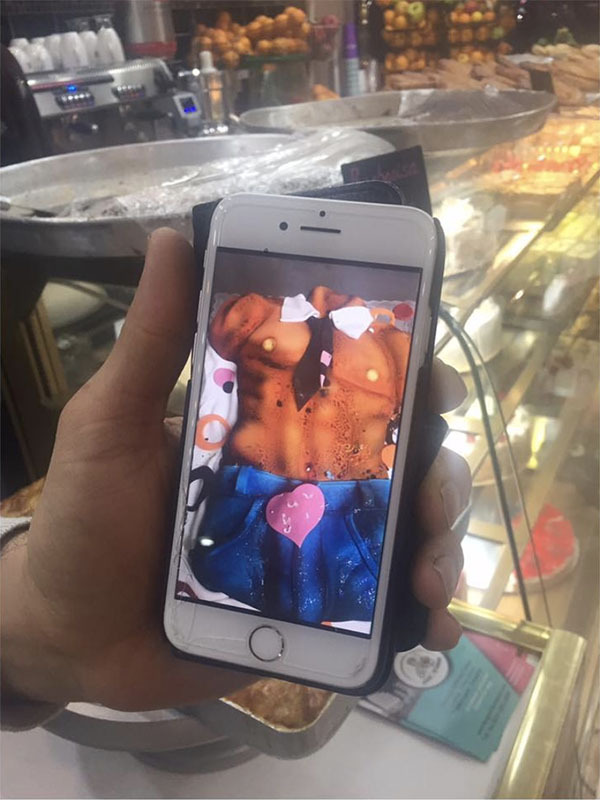 I went to the cake shop to escape my cynical thoughts about the false promises of childhood, but I left having been sweet talked into ordering a custom-made cake of my friend’s torso that I wasn’t sure I really wanted. And I would have gotten away with it too, if it weren’t for those meddling kids.